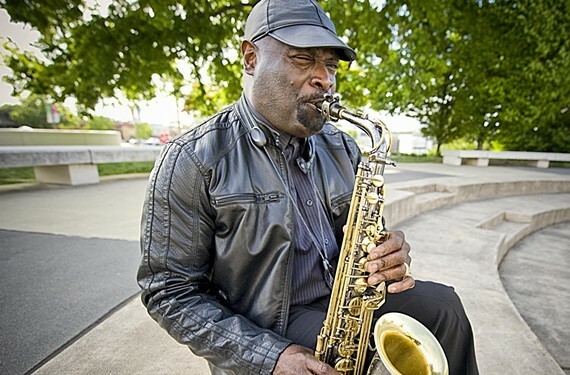 Video: Local Jazz Veteran James "Saxsmo" Gates Making Push With New Album | Music | Style Weekly - Richmond, VA local news, arts, and events. Can a bright, cheerful, funky instrumental change the world -- or at least win a Grammy? Longtime area jazzman James “Saxsmo” Gates is giving it a full-hearted try. On the surface, the video to his new single, “We Can Make It Together,” is a love letter to Richmond, or more specifically to Jackson Ward. In its heyday, Second Street was the Southern Harlem with the Hippodrome Theater host to giants such as Ella Fitzgerald and Duke Ellington. Nattily dressed, improvising on the melody, Gates is its undaunted present. Two young kids, drawn to the music, playing as Gates plays, represent the future. In the end, they push through the crowd to where the saxophonist is in full swing at the feet of the statue of Bill "Bojangles" Robinson. Together, in the context of the video, means harmony with people and with the past, at least with those parts of it that inspire forward movement. The single and the forthcoming album of the same name are Gates' big push for wider success. He’s enlisted prominent friends from his long career. Monster Virginia Commonwealth University alumni drummer Nate Smith is on the record. So is guitarist Freddie Fox, husband of Evelyn "Champagne" King and Gates' Berklee School of Music Classmate. After all, it’s only changing the world. As in baseball, if you want to score, you need to get on base. The easiest way to start is with a single.